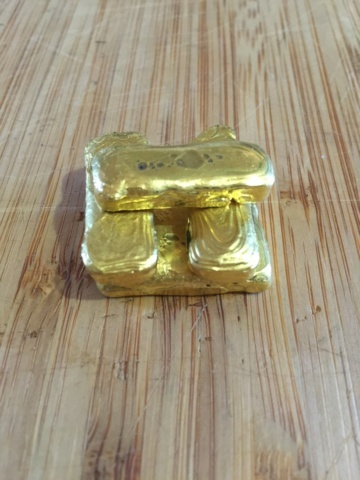 I recently sought help from a friend of mine to melt down some of my gold. He had a very simple method, using a crucible secured in a vice, Hot Devil gas bottle from Bunnings and made them into 1 oz slugs. (I have done a forum search and seen some things posted by Davesgold about a Hebel block and Johnnie but I want to keep it simple, not really into furnaces). 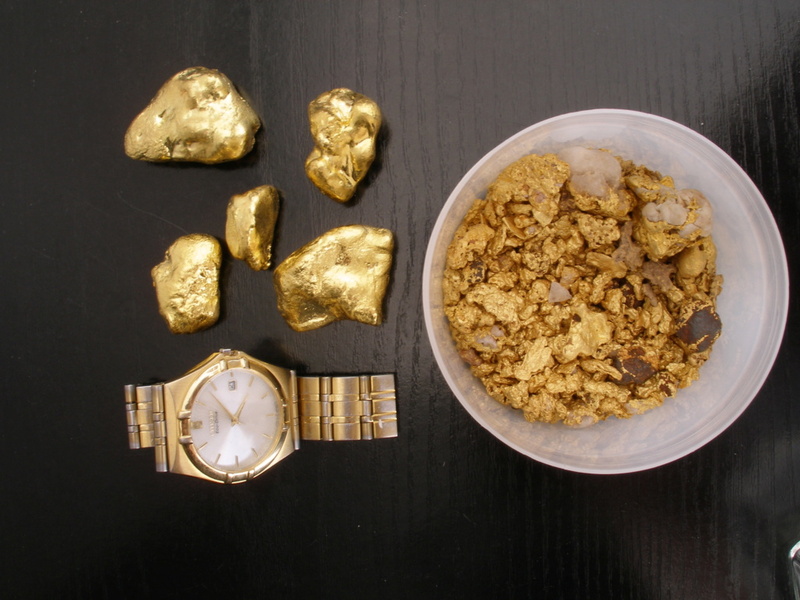 I’m keen to just melt the gold nuggets into slugs or ingots of 1 oz or 2 oz. So, I looks up crucibles on internet and it seems there are graphite ones and silicone ones. Would you give me your opinion on the best type to use and anything else you think useful. Pics would be a great help too. I’ve put in a photos of what my friend used so you ‘get the picture’. Finished product - 5.5 oz, after a dunk in some acid he had. I used a fire brick and ground a bowl shaped hole in it. The smaller the gold melt the easier it is to melt. I used the cheap can gas.Propane or Butane has flame temperature of about 1960 to 1970 °C and Gold melts @ about 1064°C so they are acceptable for the job. The five bits above the watch add up to 16+ ounces, 6 Oz is the largest. What happens to the quartz when you melt a specimen? Doesn't it have a higher melting point than gold? The gold go together when melted (just like bit of mercury does at room temperature ) and leaves the quartz behind like glass. We brought the burners from bunnings. Turns scrappy gold into this. 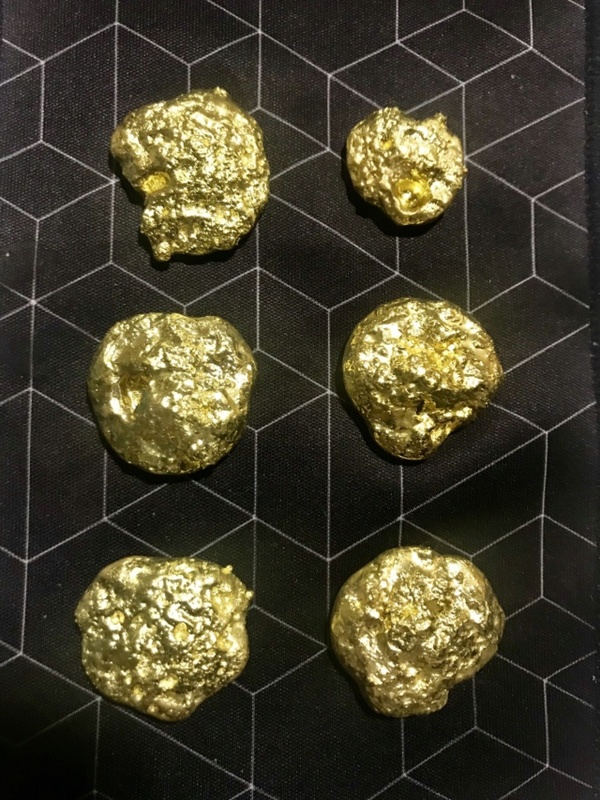 Sorry just saw this post, Melting 1oz to 2 oz gold in the method you are doing will not work very well, due heat lose, I've tried in the early days with a silicone crucible with 2 mapp gas torches and it took soooo long and still didn't get the gold flowing, that's why I use the method I use with the furnaces I make. You can try the David method but hebal can't take the temperatures that my furnace can take, but it's a budget way of doing it. With the dish Crucibles I find around 5grams and under is ideal because you can keep the flame concentrated on all the gold, as soon as the flame is off the gold it cools quickly. Hope this helps and good luck. I find that a single gas torch like in your picture takes forever to get the gold hot enough. A simple furnace, like the Hebal block ones that I made are very effective at concentrating the heat around the Graphite crucible. 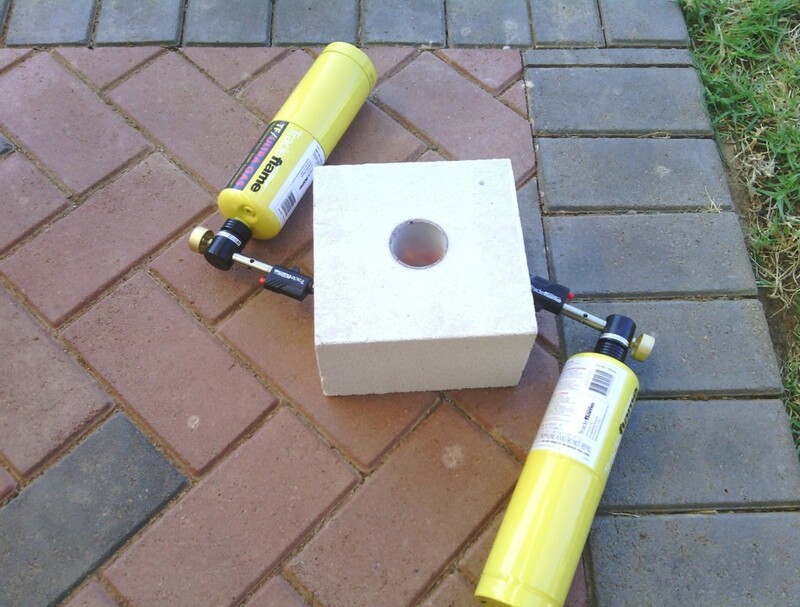 The Hebal block (600x200x200) cost $13 at Bunnings and I can cut 4 furnaces from 1 block using a wood hand saw and a hole saw to cut the main center hole, and a drill and a 1/2 bit for the torch holes. And the Hebal can take the same temps that the furnace Hobo makes, they may not last as long but they cost way less, the heat eats them away gradually just the same as it does with the graphite crucibles. 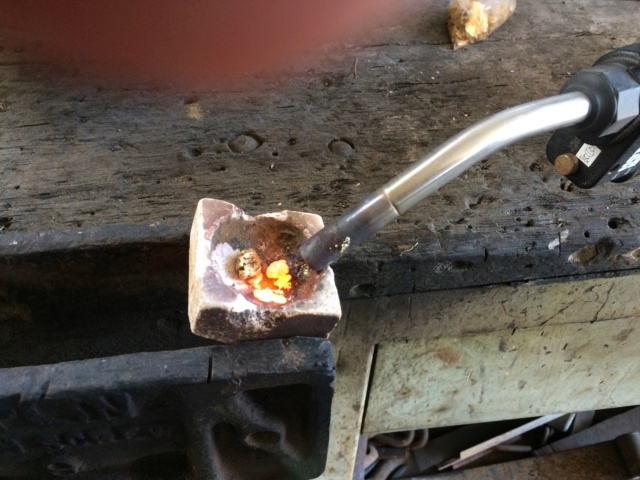 Make sure you get the bigger torch ends NOT the pencil torch ends they won't get the job hot enough, I know this and have seen this, the bigger torch ends will have the gold liquid in the crucible in about 5 minutes ready to pour. I don't use Hebel Dave so that's not correct. the materials I use take higher temperatures than Hebel. HOBO'S Gold wrote: I don't use Hebel Dave so that's not correct. the materials I use take higher temperatures than Hebel. Yeah I know you don't use Hebal, you brought up Hebal and I was just sayin. Gold melts at 1065 deg Celsius, and Hebal can take temps up to 1200 to 1500 deg Celsius, which is way above golds melting temp, and I realize the material you use can take temps up to 3000 deg Celsius, my furnace costs are way way less than yours, just sayin, yours are great and well made and you sell them, I just make mine for my own use and anyone that wants to make their own I will let them know how and what to use. I am not trying to start an argument about yours is better than mine or vise/versa, Annie was asking about what different options people use and that is what I use. all good mate. PS: I did say, "And the Hebal can take the same temps that the furnace Hobo makes" which when your using either furnace neither are getting above 1200 dec C and more like 1180 deg C so no harm is happening to either type of furnace. Thanks for the feedback guys and Jen. I still have one question - is there anything significant in the difference with graphite or silicone crucibles ie: is one thought to be better than the other? Hebel is porous, so you can lose gold into those tiny little holes. UNCLE BOB wrote: Hebel is porous, so you can lose gold into those tiny little holes. I use two of these from Bunnings and they fit on top of either the yellow map gas type bottles or the green buddy type bottles. » Birdsnests when Jerkbaiting: advice sought.